Nurseries for every budget - from luxe to less and in between! Nurseries for every budget – from luxe to less and in between! Creating a beautiful sleep space for your baby has to be one of the most exciting parts of preparing for a new arrival. But it can also be overwhelming – we’re certainly blessed with some stunning nursery furniture options. We’re narrowing it down a little, by giving you some fabulous nursery creations from Babies R Us – no matter what your budget, you’re bound to find a beautiful cot and accessories to suit. 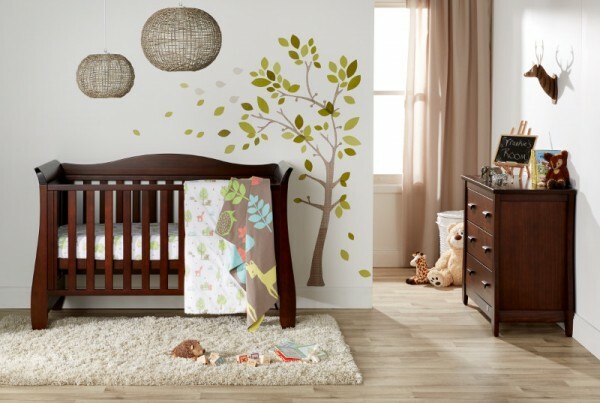 A stunning nursery need not cost the earth – it’s all about investing in key pieces. When you manage to find the perfect hero piece, the rest will fall into place. And in a nursery, the crowning glory (besides your beautiful bub) is the cot. Invest in a well-built, safe and durable cot that’s easy on the eye, and you’re more than halfway there. 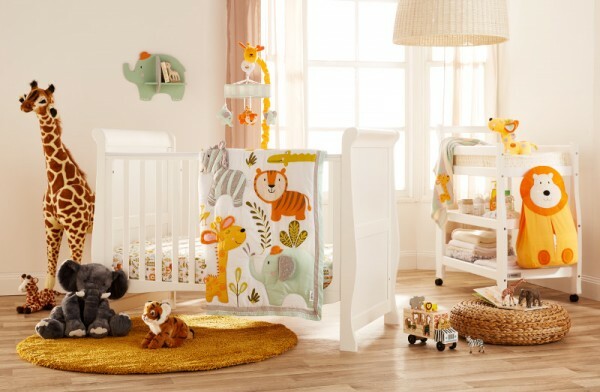 Take a look at the nursery above – it (along with the one shown at top of the post) has been put together using pieces from Babies R Us – and comes in at about $1150. That’s including the Harper Cot, which will be available from August for $399.99, change table, cot bedding set, mobile and that adorable, tall giraffe. The timeless, neutral furniture pieces have been accented with linen and soft furnishings that team with a playful theme – the jungle. It creates a happy, playful, unisex nursery for a rather ravishing price. There’s also the option to splash out a little on a few extras, if your budget allows. 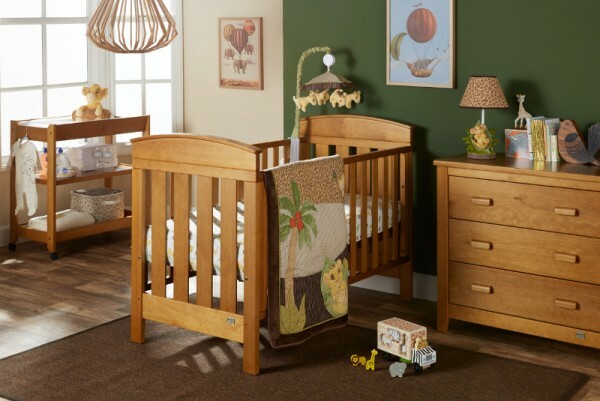 Going for dark timber nursery furniture gives a warm, high-end feel, without the need to spend a fortune. The nursery above was created with a Boori Manor Cot ($699.99), along with a matching change table and chest of drawers, the cot quilt and sheets, all for under $1700. And the beauty of going for a cot like the Boori Manor, is that it’s convertible – so will become a toddler bed when the time is right. It’s budgeting at its best – two for the price of one! Of course, many of us choose to splurge when it comes to creating our child’s nursery – it’s hard not to when there are so many gorgeous items out there. But even a luxury nursery doesn’t have to be over-the-top Hollywood baby expensive. The nursery above uses three amazing pieces that come in at the $2200 mark. The Aurora Cot, which will be available from August, is $799.99, the Boori chest of drawers is $599.99, and that amazing Bebe Care Regent Glider is $799.99 (and this includes four legs to convert it into a regular chair – clever!). With such high quality furniture, it takes very little else to lift this nursery to the next level. An on-trend decal, some cosy rugs and a throw are all that’s needed to accent these stunning pieces of furniture. Mattresses are not included with any of the cots shown here, but are available separately from $79.99. No matter what your budget, you can find nursery furniture and accessories to suit at Babies R Us. Take a look through their nursery book to see just how stunning your baby’s nursery can be, no matter what you’re spending. (This is a sponsored post for Babies R Us).